In the news this week in Latin America: Chile celebrates a happy ending to the miners' saga, Chavez and Medvedev sign a nuclear agreement, catastrophic rains in Nicaragua and much more. Ceasefire correspondent Tom Kavanagh delivers his weekly round up of what's been going on south of the border. The world watched as 32 Chileans and one Bolivian were rescued from the San Jose mine on the outskirts of the city of Copiapó on Wednesday, having been trapped underground for ten weeks. Legal proceedings have already begun, with the families of 29 of the miners launching a suit against the Chilean state and the company that operated the mine over allegations of gross negligence. Families had endured 17 days fearing the worst of the miners prior to rescue teams establishing contact which established that all the men were alive, and the ordeal for the trapped men lasted 70 days as numerous attempts to reach them failed. Tempering the joy at seeing their husbands, sons and fathers pulled from the Earth, however, is a feeling of anger, as families allege that Compañía Minera San Esteban (CMSE), which manages the mine – which itself was temporarily closed over safety concerns in 2007 before being reopened the following year – ignored warnings from miners that conditions were not adequate. Chile’s mines were privatised and sold off under General Augusto Pinochet, whose authoritarian rule began following a 1973 U.S.-backed coup. Today all mines in the country of 16.6 million are in private hands. 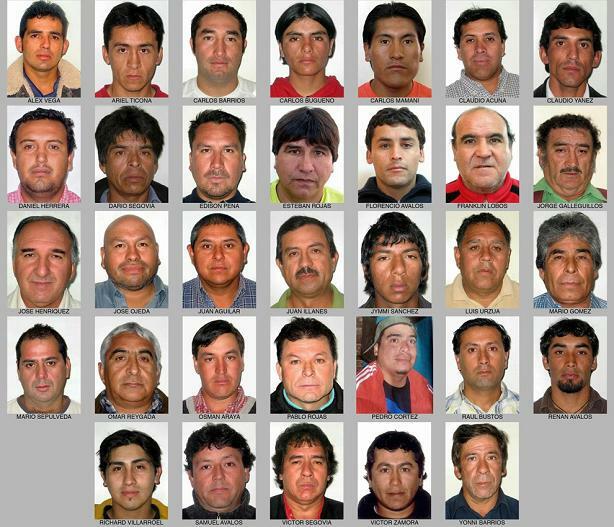 Mining in Chile is notoriously dangerous, with an average of 39 fatal incidents annually along with many more injuries. The country’s billionaire president, Sebastian Piñera – who has significant personal holdings in the mining industry among other sectors of the national economy – has grandstanded with the rescued men in the wake of their escape, but many have condemned his government for ignoring concerns over the risk posed to Chilean miners, and have accused the state of turning a blind eye as people continue to work in unsafe conditions. As one of the families’ lawsuits was filed in the town of Copiapó, the closest municipality to the mine some 500 miles north of Santiago, at the end of September, the mayor of the town of Caldera, Brunilda González, said the motion accused the state over its “lack of a vigilant attitude” towards mining conditions. She accused authorities of failing to ensure “compliance with laws that protect the right of miners to work in a safe environment with the smallest possible risk of accident.” This suit is seeking a total of US $24 million in damages from Compañía Minera San Esteban and the Chilean state, with González estimating that each miner would receive around US$1 million. She voiced sentiments shared by many of the miners’ family members, telling reporters that “for every day, minute, and second they are underground, we want [the company owners] to spend that time in jail.” The mayoress continued: “No Chilean businessman has ever paid a day in jail [for mining-related deaths]… We aren’t just asking for money. We are saying this was negligent homicide. A businessman knows that sending workers to a work without safety measures is sending them to their deaths.” Relatives of the trapped miners have confirmed that the mine’s poor safety record was known to those who worked there. Former CMSE risk assessor Vincelot Tobar has accused the company of ignoring warnings regarding safety conditions at the mine despite repeatedly being informed of them. Tobar affirmed, “They never carried out the most fundamental adjustments needed to avoid disasters like what we’re seeing today. They always pushed on production. I was the only risk assessor, without a computer, secretary or even a phone.” There is also considerable anger at the government for allowing the mine to remain open despite working conditions violating minimum security standards. 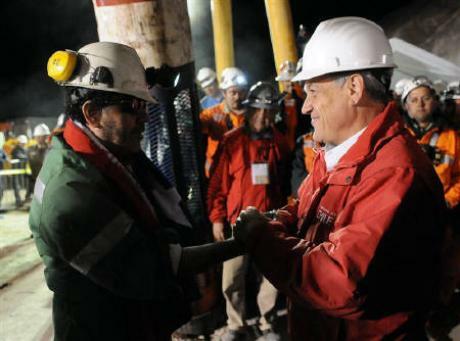 Sebastian Piñera’s international representation has been boosted by the ultimate success of the rescue effort, with the president making sure to involve himself in celebrations as the miners arrived back above ground and gaining considerable political capital in the process. He will address the London School of Economics this evening on the first leg of a tour of Europe, with several groups announcing they plan to protest the president’s visit to Britain over ongoing abuses of indigenous people at the hands of the Chilean state. Venezuelan President Hugo Chávez visited Russia this week, arriving on Thursday and meeting with Russian president Dimitri Medvedev in Moscow, where the two leaders announced numerous cooperative projects, including the construction of a nuclear reactor in the South American country. 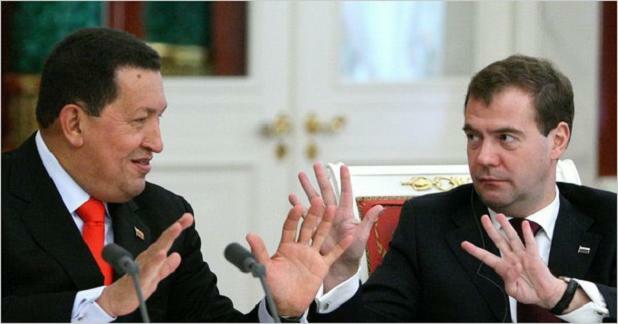 This is the Venezuelan head of state’s ninth visit to Russia, and is representative of increasing collaboration between the two nations under Chávez’s presidency. 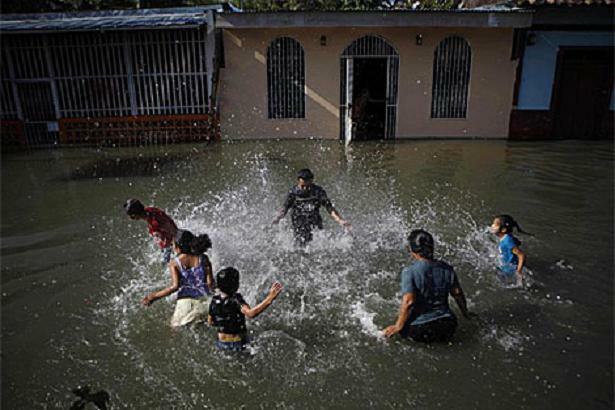 Heavy rainfall and flooding which has hit Nicaragua particularly hard since May has lead to a health crisis in the Central American country, where 16 people have been confirmed to have died from leptospirosis. The government confirmed the figure on Sunday, and has declared a state of emergency over fears of the spread of disease. First lady Rosario Murillo confirmed that a “contingency plan” had been launched to prevent the spread of infection, which is particularly prevalent in the north-western region of the country. Cuba, whose government is a close ally of Nicaraguan President Daniel Ortega, has promised to send a plane containing 12 tonnes of medication and rodent extermination equipment. This includes the product Biorat, an organic rodent control treatment used to prevent the spread of leptospirosis, bubonic plague and fever. Nicaragua’s Ministry of Health has reported that 146 people have been affected by the outbreak of illness, and have stressed the urgency in dealing with the crisis before more people are afflicted. In addition to aid, the Cuban government is sending leptospirosis expert Reynaldo Espino to Nicaragua. The specialist worked combating the disease in Central America in 1995, when a similar bout of infection hit the country. The disease, common in tropical climates, is usually contracted when skin wounds or finger or toenails come into contact with water, earth, vegetation or waste that has been infected by animal urine. During periods of intense flooding, drains and sewers overflow and it is much easier to come into contact with the disease. Stagnant bodies of water are also recognised as breeding grounds for infection. Cuban state newspaper Juventud Rebelde (Rebel Youth) this Sunday announced that Cuban pilots and aircraft had been used to transport 150,000 Jews to the fledgling state of Israel from other Middle Eastern nations in the early 1950’s. The flights, described as a “gigantic aerial evacuation” by Cuban aeronautic historian and retired captain Rolando Marrón, took place between 1951 and 1952, a full seven years before the Cuban Revolution which dispensed with the rule of U.S.-ally Fulgencio Batista. Batista himself was not even in power when the flights began, with all operations being carried out by a company created in Havana by the Israeli government for that purpose. Marrón said that “in the two years that the mission took, we transported around 115,000 refugees from Iraq, 25,000 from Iran, and several hundred from India and Yemen.” Following the declaration of the State of Israel in 1948, many Middle Eastern countries which had been home to Jewish communities for several hundred years expelled them en masse, with many of the refugees taking residence in Israel. Today Cuba and Israel do not have active diplomatic relations; indeed Israel sits alongside Palau and the United States as one of three countries which support the economic embargo against Cuba at the United Nations. The Latin American Jewish Council estimates that some 1,500 Jews live in Cuba. The Israeli government reports that around 400 Cuban Jews emigrated to Israel in the last decade. The head of the Brazilian Green Party (PV) has confirmed the party will not back either candidate ahead of the run-off between Workers’ Party (PT) candidate Dilma Rousseff, who has the support of outgoing President Lula da Silva, and the Social Democrats’ Jose Serra, the former governor of Sao Paulo state. 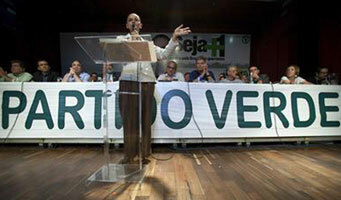 Jose Luiz Penna, the president of the Green Party, said the party would stay “independent” ahead of next Sunday’s vote. Marina Silva, Brazil’s former environment minister and Green candidate for 2010, finished in third position in the first round of voting, obtaining a surprising 19.3% of voting, equivalent to 20 million votes. Her support is considered by observers to be crucial in determining the winner of an election which could see Latin America’s most populous country elect its first ever female president. Serra took 32.1% and Dilma 46.2% of votes in the first round, and the PT candidate is expected to take a comfortable victory in round two.